Turf can be laid this month so long as the soil is not too wet and it’s not frosty. It’s best to use planks to work from to save compacting the soil and allow several weeks for the roots to get established. For existing lawns, also when it’s not frosty, have a walk about and look for any spongy areas and moss growth. 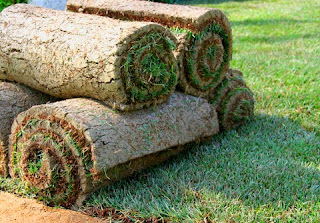 You can treat this by aerating if it’s not too wet and when conditions are drier scarify the lawn to lift the thatch and moss. It’s better to wait until spring before applying fertiliser and one combined with moss treatment because you don’t want to promote growth before the weather improves. That said, you may find the weather has promoted growth and there’s a chance a first mow is needed this month. Set the mower or cutting deck on the garden tractor to a high height so you only tip off the top part of the leaf. Worm casts can be a nuisance and need brushing off with a stiff broom, but only when the surface is dry. It’s about this time of the year when the lawn care professionals start thinking about top dressing, when the grass starts back into growth. Adding a fine layer of fresh soil to the lawn’s surface helps to build the soil quality and benefit the grass. Top dressing is best done when the lawn has been aerated and scarified to remove moss and thatch. A mixture of loam, sand and peat, or peat alternative, is applied on a dry day – you can buy the mix in bags from the supplier or have it delivered in quantity. 3 to 4 kilos per square metre applied, without smothering the grass, will fill in dips and hollows and smooth the lawn. It’s advisable to apply two loads of top dressing in spring and another in autumn.